Calicut is famous as an ancient Port City, also known during the Zamorins' heyday as The City of Truth. But one would not ordinarily describe Calicut as a city of many hills - till one gets either an aerial view of the city as the plane maneuvers to land on the Karippur runway OR a view of the city from the Arabian Sea in an approaching ship or boat. This is the view described by early mariners who would approach the shores of Calicut. They would first sight the Nilgiri hills at a distance and Wynad hills further to the north. As one gets closer, the undulating hillocks in and around Calicut come into focus. This is the impression of Calicut port as portrayed in contemporary paintings and engravings of the 15th - 18th Centuries. The accompanying engraving which figures in the Oriental Memoirs by Forbes (1810) is an instance. this coast (of Calicut) look like straggling villages, with a background of distant blue hill and a middle space of trees, divided by a strip of sand from the watery plain. 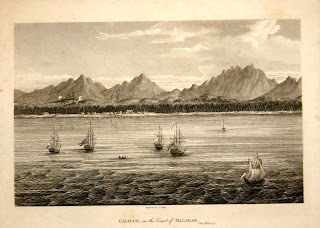 He explains further what he meant by the 'distant blue hill' in a foot note : The mountains distinctly visible from the sea off Calicut in clear weather, are the Koondah range of the Neilgherries, or Blue Hills. Come to think of it, Calicut has a large number of places with 'hill' suffixed - the most obvious are West Hill, East Hill, Silver Hills and Florican Hills (Florican, incidentally is a bird of the bustard family which is virtually extint now in Calicut). Then there are the vernacular names : Pokkunnu, Eravath kunnu, Katcheri kunnu, Kariyakkunnu, Kalathilkunnu etc. Interestingly, there is an ancient Nair family in Calicut called Palakunnath (literally, Of Many Hills). Its original location is near Chevaur (Kovoor) and the many branches of this family used to hold possession of several hillocks around stretching from Chathamangalam to Kuttikkattor. Today, the hillocks of Calicut have been overshadowed by the high-rise apartments, as seen in the accompanying picture! Another splendid one from CK. Illuminating and, as always, a lovely read. Congrats CK The hills never looked so good as in the image your blog carries. By any chance is the view from the Tamrind Nest?Really great view. Informative blogg.One doubt-Is Palakunnath-Pala[tree] Kunnth ? In 1978 I came to Calicut by ship and landed in front of Beach Hospital. I was at the bridge of the ship with the captain. From about 15 nautical miles, we could see the East Hill, and that was the first sighting of land. East Hill was most of the time residence of Dist Collector. Beautiful observations CK. It is interesting to note how much awe those early travelers had when about Calicut and its gentiles...But the hills they would have been used to would have been bigger, I have not observed if they are so visible from the sea..Maybe Jaipee has a point, which are the other hills? Many thanks, Uday and Mammed for the kind words. Yes, Premnath, it is indeed a view from the Tamarind Nest. I checked up on Palakunnath - it is many hills and not the Paala tree. Maddy's comments reinforce the point- nowadays we dont even recognise the many hills listed due to the buildings that have come up. Jaipee was lucky that he could at least spot the East Hill in 1978. Today, with all the 'sea-front luxury apartments' coming up, none of these hills which were once the sentinels of the city, will be visible from the sea. Once again I have stumbled upon on this interesting blog. Had forgot it in the political quagmire. If you have to get a view of the hills today, you will have to look down from Pokkunnu towards the sea. But there is none like the steep ones pictured by the English painter within today's city limits. The nearest hillock would be Puthiyara where there is the jail and Taluk office. Eravathu kunnu is nearly three km away from the sea. That painting was there on the British Library Museum website until last year. There were a number of pcitures like hundred year old photographs of several temples including several snaps from different angles of Tali temple. Not seen anymore. I wonder why did they took it off their site?